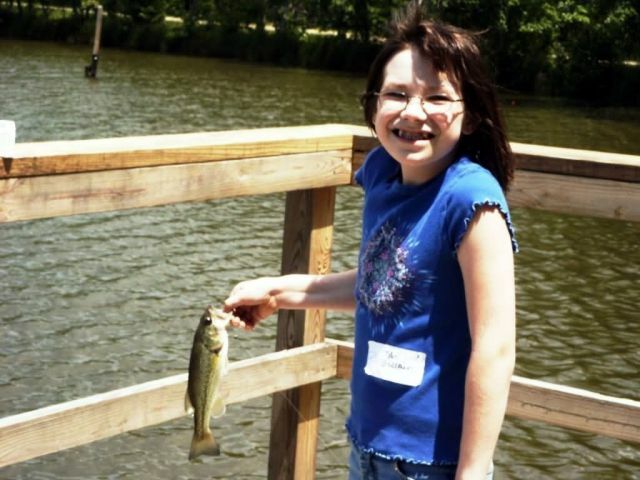 The 4th annual youth fishing event occurred at Occoquan Bay National Wildlife Refuge in Woodbridge Va. on May 21, 2005. FWS personnel, Friends of the Refuge, and volunteers from the local Rod & Gun Club staffed the registration booth, gave out rods and worms, and escorted the kids to the pond to teach fishing techniques. Trout Unlimited provided bait casting lessons and taught some fisheries science. The fish also cooperated well as most kids caught multiple fishes including largemouth bass, catfish, white perch and bluegills. The new wooden fishing dock provided much usage and the new wooden pavilion provided nice shade for lunch. All kids who caught a fish were given a Polaroid picture of themselves and their catch, a signed fishing certificate, a bag of goodies, and in addition prizes donated by the local WAL-MART and Gander Mountain were given out at random.